It’s all good! I am always happy when food I make disappears. Enjoy my twist on the traditional Middle Eastern dip with pitas, crackers, carrots, breads, wraps, whatever you please!I also took a whole bunch of fresh, thick, handmade pita from Tom Douglas’ Dahlia Bakery downtown, and made these tasty pita chips to go with the hummus. Let me mention that I had tried 4 times before to get pita at Dahlia. Every time I got there, the pita was gone, but this time I won the last pack of the day. They make limited amounts to sell fresh daily, and believe me you will enjoy the beauty of the freshness when you get your hands on it! I simply cut the pita into wedges, toss them in oil, salt, pepper, dried oregano, and bake them at 350 F (175 C) until crispy. 1. While the pita wedges bake, pulse all ingredients except oil in a food processor, a few times. 2. Slowly pour in the olive oil while you pulse to get the consistency you like. We like our hummus pretty thick. If you want it loose, add more oil and pulse some more. 3. Taste for salt and adjust if you need more. 4. Spoon it into a bowl, sprinkle with more red chili powder, and serve with the hot pita chips! The colour on this hummus is awesome…praise thee tumeric. 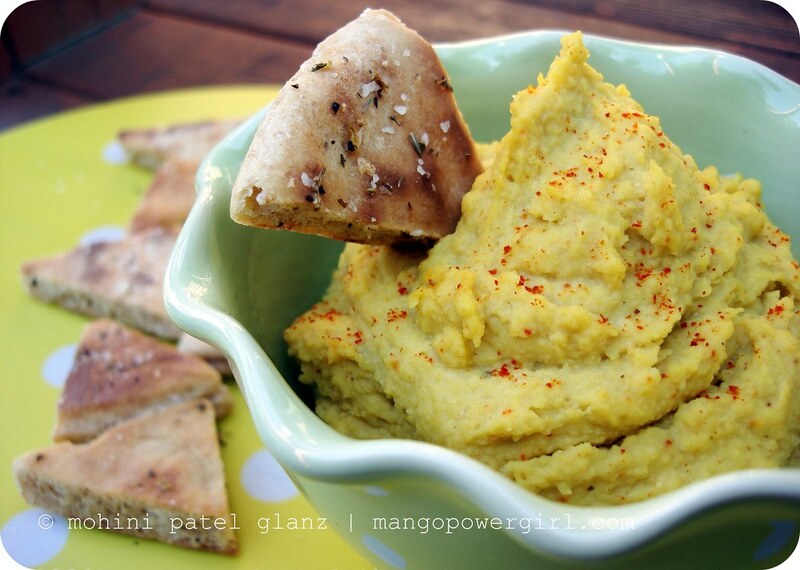 Love that you’ve added turmeric to your hummus! I’m always looking for ways to use more of it. This looks so delicious – and simple to make, I like that!I love your recipes and the photography is so sweet! My stomach rumbles everytime I view your posts.Will you come and cook for me? Hummus is such a great dish. Yesterday I made hummus, and I ate with rotis! Yellow hummus looks delicious! OMG no things sour, no tahini … thats not even sour !!! r u kidding ??? i would throw a fit if anyone got so choosy in my house !! !Shabbash to you … u manage …hahanice variation with the hommous girl .